Muskegon, Michigan, USA...For many applications, the values and engineering data in bearing manufacturers' catalogs provide all the information needed for bearing selection. But in critical applications with a narrow performance window, designers need the greater safety margin provided by acceptance testing or end-of-line verification. Acceptance testing adds a dimension of quality control and performance reliability, often supported by formal documentation. It also reduces unexpected downtime to repair or replace components that fail to meet system requirements. 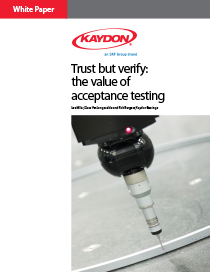 Kaydon Bearings engineers Les Miller, Dave VanLangevelde, and Rick Burgess explain when to test, how to develop an acceptance test plan (ATP), and typical elements of an ATP in this new white paper.